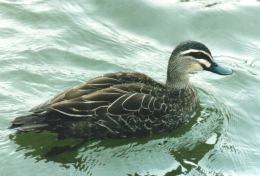 This is probably the most familiar and common of all native ducks to Australians. The Pacific Black also has the distinction of being the most heavily hunted duck in Australia. It is closely related to the introduced Mallard and is often found to breed with it, producing a hybrid. It is pleasant chocolate brown, with a paler head and a distinctive dark brown stripe through the eye and a dark cap. The speculum, obvious in flight, is a pretty purple green. Quacks just like a duck, with no distinct sounds. They found in Australia and Southeast and Pacific Asia, seems to be more common in the temperate areas.